Would a fight between Haye and Chisora go someway to making up for such an ugly mess on boxing? By Simon Hirst: David Haye and Derek Chisora were involved in a very high profile brawl after Chisora’s 12 round loss to Vitali Klitschko. Looking at the video evidence, Haye threw the first punch on Chisora which started the brawl, but given Chisora’s behaviour over the weekend of the fight, it could be argued that Haye hit before he was hit. The first point that should be made is this type of behaviour is wrong and does not do the sport any good whatsoever. The focus is now on out of the ring behaviour rather than what happened inside the ring, which was an interesting bout, possibly Klitschko’s hardest test since Lennox Lewis. Obviously, it sends a terrible message to the youth of today who think they can settle things by brawling, or even picking up what Chisora said in he will shoot him and glass him. It is in fact a reason as to why people start boxing, to learn that discipline in life and channel it as a skill. Many boxers have come off the street, some even from prison and took up boxing which allows them to channel their aggression. The brawl was the in fact opposite of what boxing does in people’s lives. So in looking forward, their must be a full investigation into this, of course. The guilty should be made to pay, but where it hurts and that is their pocket. That is where the BBBoC can hit Chisora, but not Haye due to him having no licence. However, I think a good could come of this, if done correctly. It is obviously being banded about, even betted on as we speak, but this is an incident that should be settled in the ring. David Haye vs Dereck Chisora. 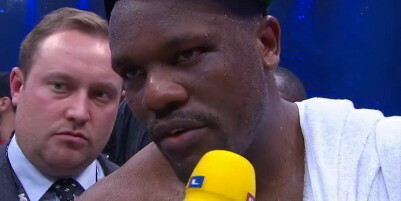 Chisora has proven himself at heavyweight and that he may not be beating the top top heavyweights, but he sure can compete. This is how it should work, have police at the presser to announce the fight forming a line between them to ensure a repeat does not happen. Do a series of their training, almost HBO 24/7 style where the public can see how hard they train. We could have some television interviews talking about the fight on chat shows. Then at the weigh in – have them come in separately and do a face off with a piece of Plexiglas between them to ensure no bad behaviour. Then in the ring, they can settle their difference, where it should be settled. Then after the fight, they should shake hands and that be the end of it. None of this nonsense of glassing or shooting. Just a straight boxing match. It would create interest in boxing, set a good example for people taking up boxing and show why boxing is not only one of the most exciting sports, but why it is important in our culture today. Boxing » David Haye » Would a fight between Haye and Chisora go someway to making up for such an ugly mess on boxing?